The grand event this year – WordCamp Kathmandu 2019 is all set to take place in the month of March 2019. The two-day event is going to be held on 16th and 17th of March 2019 at Bougainvilla Events in Tripureshwor, Kathmandu. The awesome WordCamp Kathmandu team is currently seeking Media Partners to cover the whole event—before, during and after. The Call for Media Partners is now open for magazines, blogs, TV, Influencers, Newspapers, and Radio Stations. It is a great opportunity for the media platforms to not only promote the event but also to promote their platform and grow visitors. Being an official media partner gives you a chance to present unique content for your audiences to enjoy. As an official Media Partner, you will be committed to offering top-notch media coverage before, during and after the event. This includes articles, social media posts, interviews and more. You will have to provide news related to WordCamp Kathmandu 2019 and update the latest development process. So, if you’re a media platform and are ready to deliver what it takes to be a media partner, apply for the Call for Media Partners and start promoting the event. 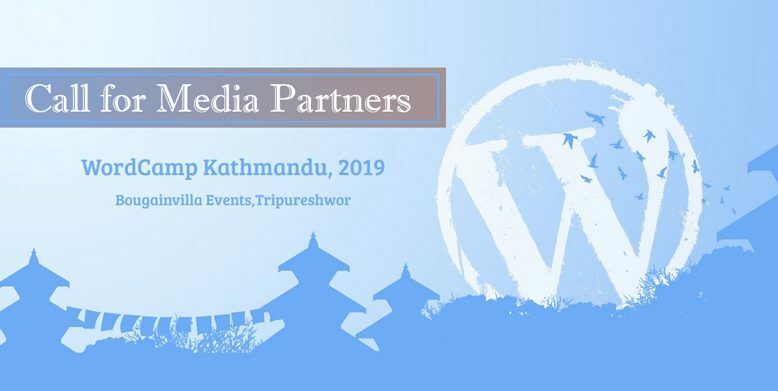 The Call for Media Partnership form is available on the official website of WordCamp Kathmandu 2019. ← Previous Previous post: WordPress Birgunj February Meetup 2019 Announced!